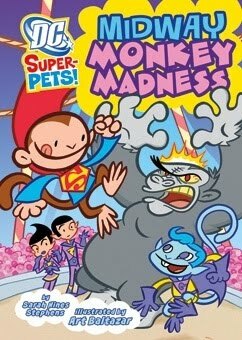 Midway Monkey Madness is just one of the books from the DC Super-Pets Series. It should be noted that even Super Heroes have pets and Superman's is a pet monkey named Beppo, and he happens to have all the same powers that Superman has. Beppo the Super Monkey's favourite place is the carnival and on the day that he decides to visit and have a day of fun, so does the evil ape, Gorilla Grodd. The evil ape is tearing through the midway ripping the animals cages apart and setting them free. People are in a panic and Beppo has to save the day. With many sound sight words to set the tone, Beppo, with the help of the Wonder Twins, Zan and Jayna and their monkey, Gleek, work together to stop Gorilla Grodd from destroying the midway. I thought the illustrations were quite colourful and drawn in an appealing fashion. If your child is sensitive, they may find it a bit violent but I am positive young readers will enjoy the book and wish to read other books from the DC Super-Pet Series. You will find at the back of the book a glossary of terms, a full listing of all the DC Super-Pets, jokes and more. When a carnival comes to METROPOLIS, the evil ape GORILLA GRODD turns a festival of fun into a day of destruction! BEPPO THE SUPER-MONKEY, along with the WONDER TWINS and their space chimp, GLEEK, must stop his midway madness.